You may have canned, or pickled, but have you…fermented? (It’s not as personal of a question as it sounds). Fermentation is an age-old tradition of storing foods, and it also may impart critical health benefits. As long as you have the right equipment and the right preparation, you can make the perfect kimchi, sauerkraut, or any other fermented food made exactly to your family’s taste. And here’s the best part: It’s extremely easy. All you need to do is assemble the ingredients, forget about it for a week, and then – ding! – it’s done! So what exactly is fermentation? According to Chef Ernest Miller, a fermentation expert at Rancho La Merced Provisions, it is the process through which various microorganisms convert the carbohydrates in food into byproducts such as ethanol, acetic acid, lactic acid, carbon dioxide. During this process, the food’s texture, flavor, aroma, nutrition, and appearance is transformed – and the food can be preserved for longer use. Fermented foods have been growing in popularity because of growing awareness of “gut health” and the need for healthy bacteria in your digestive system. These foods tend to be rich in so-called “good bacteria” that help break down compounds such as such as sugar and can make foods easier to digest and absorb. In some cases, fermentation can even produce B vitamins that were not present before the fermentation process. Lacto-fermentation, the kind of fermentation we did, is an anaerobic process (without oxygen) that converts carbohydrates in plant materials to lactic acid. According to Miller, to do this kind of fermentation, all you need is water, salt, vegetables, and flavor. The fermentation begins with the salt killing off the “bad” bacteria. Then the “good” bacteria, lactobacillus, breaks down the lactose and the other sugars into lactic acid. To get started with fermentation, you can try your hand at making a simple curtido, the Salvadoran fermented cabbage dish that is akin to kimchi. If you’ve ever been to a pupusa stand, you’d recognize curtido as the topping that is served on top of the pupusas. 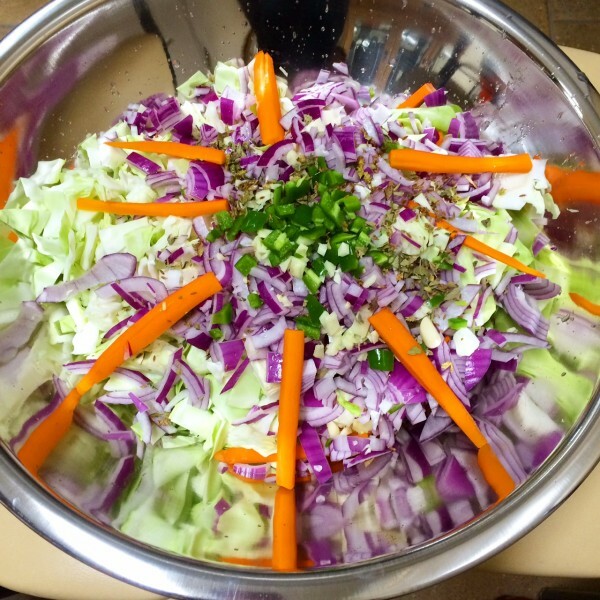 To make curtido, you start with a mixture of fresh chopped cabbage, carrots, onions, garlic, jalapeno pepper, and cumin seed (don’t use ground spices in brines; it will make them cloudy). For this fermentation, we used a 3% brine solution (one ounce of salt per one quart of water, plus one ounce of salt per every three pounds of vegetables) because the vegetables were already sliced. If we were using whole vegetables, we would have needed a 5% brine solution (1.6 ounces of salt per quart of water). Once you assemble all of the ingredients, all you need to do is pack it up in a glass fermenter – and then wait. One week later: voila! Perfectly aromatic fermented cabbage. Once you crack it open, it will last for several weeks or months in the refrigerator. Interestingly, you may even notice that that taste changes over time as it continues to ferment. There’s a whole world of veggies to ferment, and this experiment is only just the beginning. 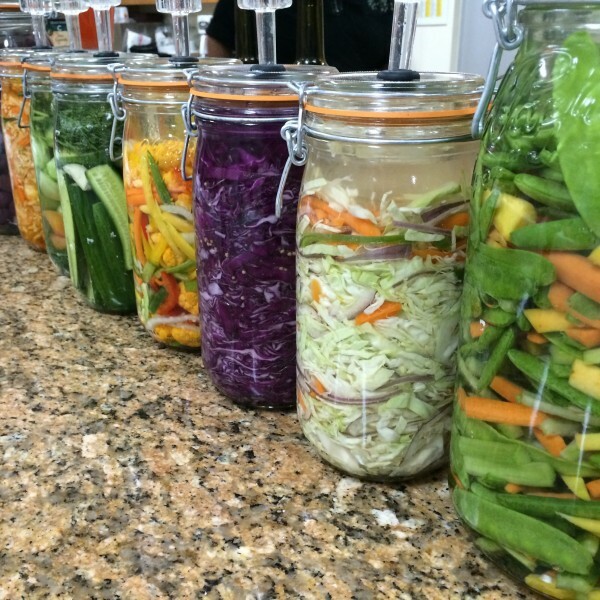 If you’re more interested in fermenting, and particularly if you’re in the Southern California area, check out RLM Provisions for more information and equipment.